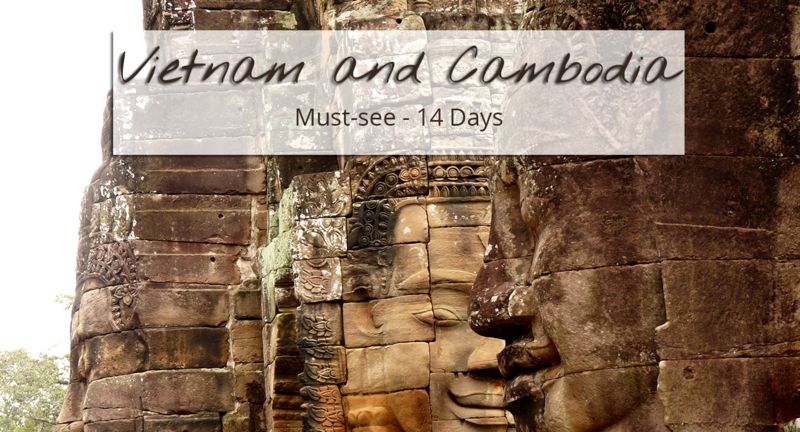 This tour will bring you to some of the must-see sites in Southeast Asia! 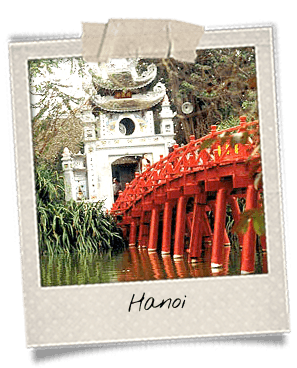 Your journey will start in Hanoi, the capital of Vietnam, a turbulent yet architecturally loaded city with plenty of UNESCO-listed places. Since you will be in North Vietnam, why not head to Mai Chau, a gorgeous verdant province, peopled by ethnic minority groups. 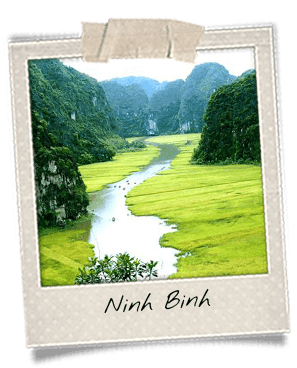 Then you’ll go to Ninh Binh, a region that combines culture and landscapes. This is where former Vietnamese capital city Hoa Lu lies, along with the “Halong Bay on land” featuring sugarloaf-shaped rocks near winding rivers. 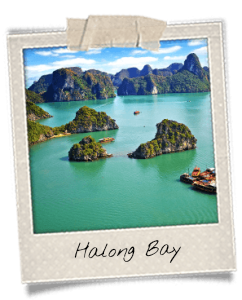 After that, you will go for the cruise of your life in the very famous Halong Bay, on a junk. 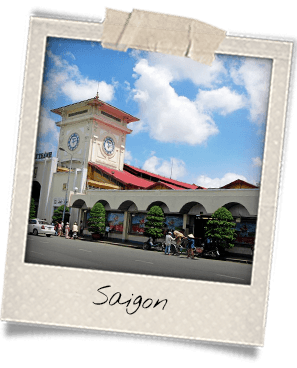 You will then fly to the south of Vietnam, to Ho Chi Minh City, formerly referred to as Saigon. You will hop on the back of a bike to discover the wonders of this busy metropolis: colonial buildings, vivid secondary streets and delicious street food. You will head to the Mekong Delta and visit several places there before getting to Chau Doc, at the Cambodian border. 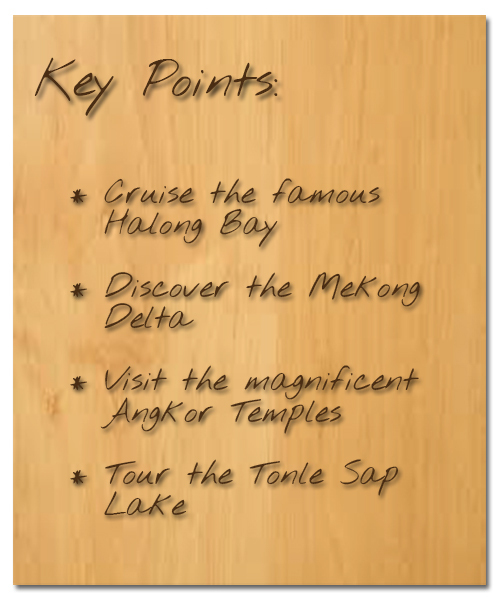 From there, you will cruise the river to Phnom Penh, the Khmer capital. Then it will be time for some of the most beautiful places on earth: Angkor. You will get to tour a selection of temples before heading back home. You will first land in Hanoi. The first day in the city will be dedicated to visits of must-see places, quarters and streets. You will take a stroll around the Hoan Kiem Lake, the “Lake of the Returned Sword,” and will visit the One-Pillar Pagoda and its red bridge. Its shape resembles a lotus’. You will also tour the Temple of Literature, a place that used to be Vietnam’s first college, and the Ho Chi Minh Mausoleum, dedicated to the national hero. You will walk around the Presidential Palace whose architecture dates back to the early 20th century and that used to be the French governors’ house. For lunch, try the very Hanoian dish called cha ca la vong. It is made of fried fish served with dill, which is very rare in Asian cuisine, turmeric, shrimp paste and of course some fish sauce! It also comes with rice noodles. You will continue your circuit in the old quarter of Hanoi in the afternoon. Get lost in the 36 Old Streets. Back in the days, each street was specializing in one product or service related to former corporations. Welcome dinner at Coyen Restaurant, in the old quarter. Overnight at the hotel. 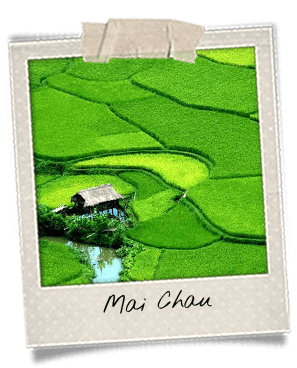 You will head to Mai Chau in the morning, a gorgeous valley nestled in the Hoa Binh Province. This verdant region is home to many ethnic groups. You will visit Lac and Pom Coong villages and meet Black Thais. You can recognize them by looking at their traditional costumes: a black skirt and a high-collar and long-sleeve shirt. Get lunch in a homestay and try local specialties. In the afternoon, continue touring mountainous villages. Get to your hotel and check in at the end of the afternoon. Dinner not included. Traditional dance show. Overnight at the hotel. You will head to Ninh Binh in the morning, where you will visit the former capital city, Hoa Lu. It comprises amazing touristic places such as Bai Dinh Pagoda, the biggest pagoda in Vietnam. You will also get to visit the famous Dinh and Le Dynasty temples. At lunch, you will have a taste of a very local specialty: goat meat. The Ninh Binh Province produces the best one in the country. How so? The mountains are just perfect to farm goats, providing them a high-quality environment. In the afternoon, you will see the other side of Ninh Binh, dubbed “Halong Bay on earth.” Just like its sister site, it features sugarloaf rocks. One difference though: they don’t grow out from the sea but from the ground in Ninh Binh. At their foot, rivers wind, providing breathtaking scenery. You will tour those beautiful panoramas on boat then on bicycle. From Ninh Binh, you will head to Halong to enjoy a cruise on the bay, a must-do while you are in Vietnam. 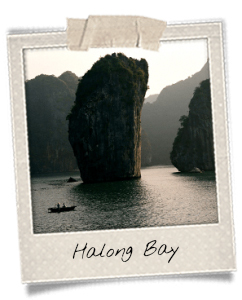 The Halong Bay comprises about 2 000 isles and islands made of sugarloaf mountains that emerge from the sea. There are also a lot of caves. Some of them have only been discovered recently! You will get lunch on the junk. In the afternoon, you will continue cruising the bay, which has been elected as one of the 7 Wonders of Nature. If you wish, you may take a dip in the water. Legend has it that the emerald color of the sea comes from the skin of the dragon lying at the bottom of the bay. Indeed, the Vietnamese name means “the descent of the dragon.” The majestic rocks would come from the flapping of the dragon’s tail when it was fighting against elements. You will also get to go kayaking in the bay. Dinner on board. Squid fishing at the sunset. Overnight on the junk. You will start the day with a smooth Tai Chi lesson on the deck of the boat. Tai Chi is a martial art related to meditation. It consists of series of slow movements. Meanwhile, the boat will keep cruising around. 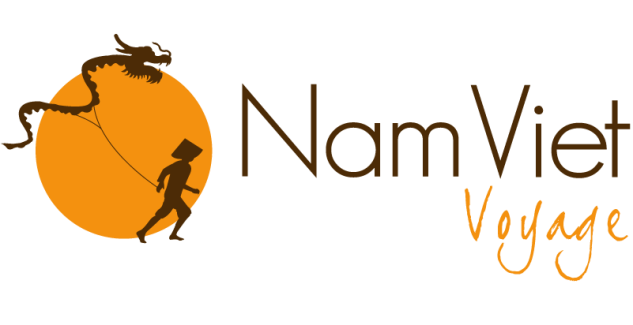 You will go back to the harbor and get a transfer to Hanoi airport. You will catch the flight to Saigon. Dinner at the airport (not included). Arrival in Ho Chi Minh City (Saigon). Overnight at the hotel. Hop on the back of a motorbike to discover varied sides of the city! You will enjoy our 7 District Tour that goes through several districts in Saigon (seven in total, hence the name!). You will explore the most well-known places of the city-center: the Post Office whose ceiling was designed by French engineer Gustave Eiffel, Notre-Dame Cathedral, the Independence Palace (from the outside), the Opera House located on Dong Khoi Street, formerly known as Catinat Street during the French colony. On the other hand, you will also go to more working-class districts where daily life is very vivid: markets, street vendors and food, hidden temples… A side of Saigon that you are not very likely to see in travel guides! Lunch will be taken in a Vietnamese restaurant. Free time in the afternoon. In the afternoon, you will continue discovering the Mekong Delta by boat. You will taste local fruits in a fruit garden, a typical feature of the region. You will attend a short traditional music show, and you will ride a bicycle around the nice landscapes of the delta. You will then go to the homestay where you will spend the night. Besides fruit gardens, Vinh Long is also quite famous for its brick ovens that popped out along the Thay Cai Canal. They feature a very specific red color and look like a range of small pyramids. It is one of the local activities that you will get to encounter in the morning during the boat tour. You will also see floating houses that specialize in fish farms. You will get lunch in a local restaurant before hitting the road toward Can Tho. Once there, you will visit the Indochinese Binh Thuy House that was used during the filming of the famous Lover from Jean-Jacques Annaud. The movie is based on Marguerite Duras’ book The Lover. Journey length: 1 hour from Vinh Long to Can Tho. 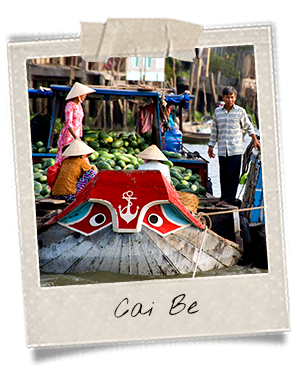 You will embark early in the morning toward the well-known floating market of Cai Rang, which is one of the biggest in the Mekong Delta. Take a glance at that vivid life happening on the surface of the water. Vendors and buyers are fast and exchanges go on from 5AM to noon! 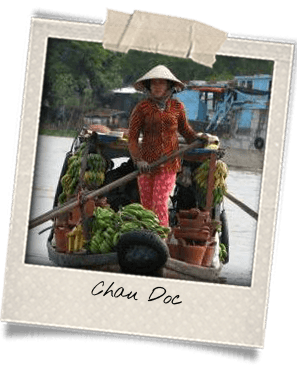 After the market, you will get a transfer to Chau Doc, located at the Cambodian border. You will stop by a local restaurant on the way to get lunch. In the afternoon, you will tour the gorgeous flooded forest Tra Su. You will hop on a bark that will bring you at the heart of tranquility. Look at the branches caressing the water; admire the duckweeds forming a natural carpet over the surface. The views are breathtaking and unique. 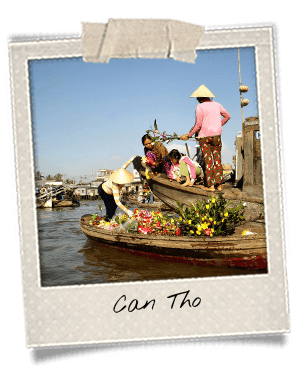 In Chau Doc, you will take a speedboat to reach Phnom Penh, the capital of Cambodia, where you will meet your local guide. Lunch in a local restaurant. Take the afternoon to enjoy the city and visit must-see places. Did you know that the New York Times had put Phnom Penh on the list of places to go in 2016? 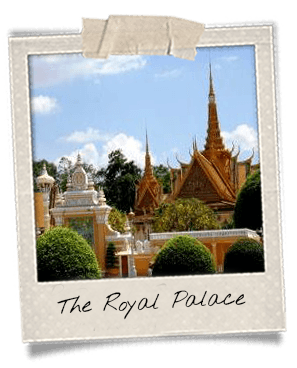 You will tour the Royal Palace, featuring some perfect example of Khmer architecture with its numerous pavilions and its 60-meter spire. You will also visit the Silver Pagoda, the fanciest in the city with its 5 000 silver tiles, 2 086 diamonds, its Golden Buddha and its Emerald Buddha. Take a stroll around the Independence Monument that stands as a large roundabout in the city-center. You will attend a Khmer shadow theatre show, called Sbek Thom in Cambodian language. This traditional art consists in manipulating hard puppets made of leather behind a fabric curtain. It dates back to the pre-Angkorian period (before the 9th century) and is inscribed on the List of Intangible Cultural Heritage since 2008. Journey length: 5 hours from Chau Doc to Phnom Penh with the speedboat. 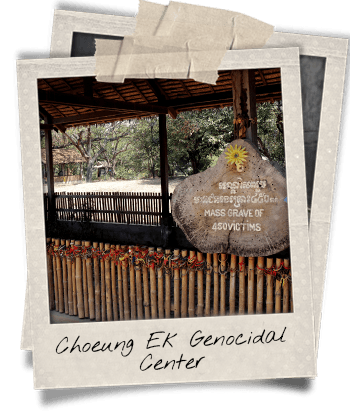 Not far from the capital city lies Choeung Ek, also referred to as the Killing Fields. It is now a place of memory but it was used by the Khmer Rouge to slaughter thousands of people. It is a very moving place. In 1988, a stupa was built dedicated to the victims. Lunch in a local restaurant. 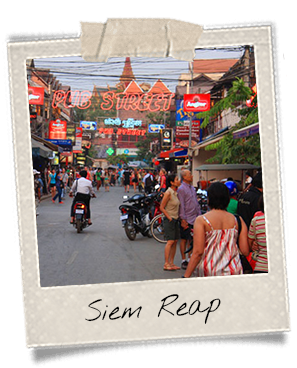 Afterwards, you will get a transfer to Siem Reap where the famous temples of the Angkor complex can be found. Journey length: 5.5 hours from Phnom Penh to Siem Reap. 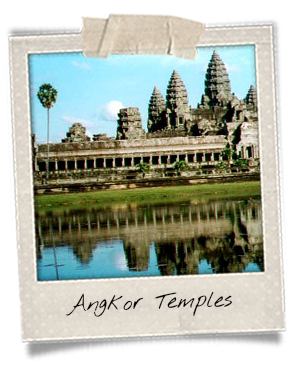 You will spend that day visiting the main Angkor temples. Built under the Khmer Empire (9th – 13th century), that ensemble stretches over 400 sq. kilometers. The remaining buildings still show magnificent features. You will tour a part of the monuments located on the so-called “small loop.” You will start with the must-see Angkor Wat, the symbol of this architectural ensemble but also of the entire country, before heading to the Bayon Temple featuring 216 smiling faces. You will discover the Terrace of the Elephants and its sculpted elephants, as well as the Terrace of the Leper King who’s got that name because of the poor state of the statue’s tips. You will admire the Baphuon, a large temple that was reconstructed from 1960 to 2011. Walk around the Hindu Phimeanakas Temple that used to be topped with a tower. Last but not least: Ta Prohm, the famous Tomb Raider temple, whose bricks are being held together by trees. You will get lunch in a local restaurant and go on with the tour in the afternoon. At the end of the day, you will get to see the sunset from Bakheng Mountain. While you have dinner, you will enjoy a very typically Khmer show: an Apsara dance. 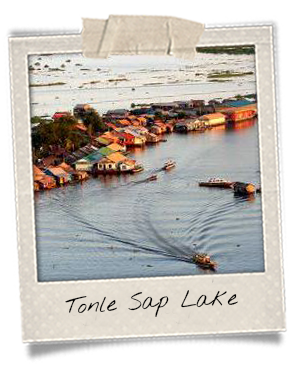 After some of the most beautiful architectural sites on earth, you will get to see another symbol of Cambodia: the Tonle Sap Lake, the biggest fresh water lake in Southeast Asia. You will go on a day-trip around that huge lake where life revolves obviously revolves around water. Villages, houses, and hospitals are floating. Buildings may be on stilts or just floating on the lake. Most people make a living from fishing. Kampong Phluk is the most famous village. It features bamboo-stilt houses. The area is surrounded with mangrove forests that you will get to discover too. You will get lunch in a local restaurant. In the afternoon, you will take a ride on an ox cart. Dinner in Siem Reap not included. Overnight at the hotel. Free time before getting a transfer to Siem Reap International Airport.